NOTE: This product is no longer available from Nancy's Knit Knacks. Look-alikes may be available but they will not have all of the featiures of our official unit and we are not responsible for them. This innovative counter can keep track of three separate projects. It includes three memories that enable you to maintain a variety of counts for your projects. Do not buy this unit from Amazon - these are not our units and we will not warrant or service them! Size W x H x D	2 x 3 x .75"
With your finger nail or you small screw driver, lift the LEFT side of the battery up and the unit should come out. 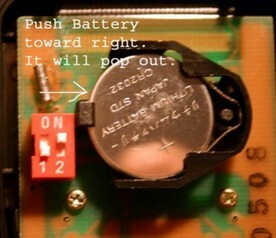 Insert new battery into the right side first and press the battery down on the left side until it clicks into place. The battery must be out while the switch settings are returned to their regular positions, otherwise, the electronics get all messed up and will not work properly. This unit was the leader in the handheld electronic counter market during the 2005-2009 period before we pulled it from the market. With the changes outlined above, we anticipate that it will regain the lead for the non-smart phone market for handheld counters. Why tie up your smart phone to do counting while knitting when you can use a dedicated counter whose only purpose is to count your rows and repeats! Designed and manufactured by a leading Japanese electronic manufacturer for Nancy's Knit Knacks, we have worked together with the manufacturer to solve all of the known issues with the original Row Counter Plus. This new unit will easily outperform any and all counters that are in the market today. An electronic row counter that can add and subtract rows on 3 separate counters simultaneously. This unit is very sturdy, small, and lightweight. It is designed to be hung around the user's neck. The 23" lanyard on this model can be removed from the counter by means of a small, quick disconnect buckle. This unit has a 2-3 year battery life. The battery can be easily changed by the user. Complete instructions are included. •	Has a reset button. •	Weighs just 1.5 ounces. •	The 3 counters each display numbers up to 9999. •	Includes a extra strong, 23" ribbon lanyard and is designed to hang around the user's neck. The lanyard can be disconnected from the unit. •	Includes a very long life battery (up to 3 years from date of manufacture) which is user replaceable. #2032 battery which is available everywhere. •	Has an audible "beep" which confirms that you have added or subtracted an entry. This feature can be easily turned off by means of the reset button (hold this button down for 3 seconds). No more pencils and paper are needed to scribble your rows and repeats down. Plus you do not need to tie up your cell phone keeping track of your knitting counts. The unit comes packaged with complete instructions for use and battery changing. 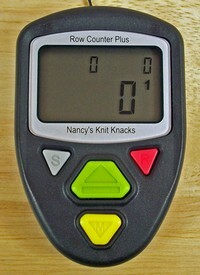 Note: The Row Counter Plus is made in the Philippines for Nancy's Knit Knacks by a leading Japanese electronics supplier. The unit has 3 counters on the display. Each counter is numbered (1, 2 or 3). In the picture above, the large "0" count is the #1 counter and is in the "active zone" (the zone which the user is currently counting) and this number can be added to or subtracted from. The other two counts that are represented by smaller "0"s are in the inactive zones. To move one of these numbers into the active zone, the user simply depresses the small gray button to the left of the large green button. This button "rotates" all three counts in a clockwise direction one position at a time. To turn the unit on or off, press the Gray button marked with the letter "S" for 3 seconds. The user's data is automatically saved when the unit is turned off. Pressing the large green button Adds to the count, and the smaller Yellow button Subtracts from the count. The smaller Red button in the upper right is the Reset button which resets to 0 any number that is in the active zone when it is depressed. This button also turns off or on the electronic beep tone if it is held down for 3 seconds. This new and improved version of our Plus unit can now be turned off. When the user turns the unit off, their data is automatically saved and cannot be lost. The user can turn off the unit by pressing the small gray button (marked with an "S" in the upper left corner) for 3 seconds. The unit will then be tuned off and the user's data will be saved. To turn the unit back on, they press the same button for 3 seconds and the unit turns on. How is it actually used? You could start counting ROWS with the number 1 counter. Let's say you have a repeat in your pattern every 10 rows. You start counting your rows with the #1 counter. When you reach 10 in the #1 counter, you ROTATE the numbers one position clockwise until the #3 counter comes into the active zone. This will be used as your REPEAT counter. You then add 1 to this counter meaning you have completed 1 repeat. You then ROTATE the counters TWICE so that your #1 counter is back in the active zone. Since this will still have a count of 10 in the display, you RESET this number to 0 and then resume counting your rows again until all of your repeats are done. The whole process goes very quickly once you learn the sequence which is not complex at all.